Welcome to The Wiggle Room! Thank you so much for checking out our website. We are an all day, indoor play center located in Crofton, MD that is designed by parents for parents. We understand how difficult it can be to find safe, affordable and effective ways to keep your little ones entertained, because we’ve been there! That’s why we created this awesome space where your kids can play, have fun and engage in different indoor activities while you sit, relax and meet other parents. The Wiggle Room is the perfect indoor play center for children five years old and younger. Our open, 3,800 square foot playroom is filled with fun, interactive toys and play structures that will keep them wiggling with joy while you take in some of our parent-friendly amenities. Grab a cup of (free) coffee and relax in one of the big, comfy chairs in our parents lounge. We’ve designed it so you will still have a full view of the playroom and can keep a watchful eye on your child at all times. We also have a quiet room, which is perfect for those moments when your toddler needs a little break from all of the excitement, or when their infant sibling needs to be fed. We know you’re busy, so take advantage of our indoor activities for kids on your schedule. While other indoor play centers in Crofton, MD may have strict play schedules, The Wiggle Room invites you to stop in at any point during our open play hours and stay as long as you’d like. If you have to leave for a bit, that’s no problem; feel free to come back as often as you’d like. With all of the other things you undoubtedly have on your plate, your little ones should play on your schedule, not the other way around. While here, your kiddos will have the opportunity to explore, socialize and take part in a wide variety of activities while you take a much-needed break from chasing them around. Let them use up some of their energy in a fun, interactive environment. Don’t worry about calling ahead – unless you want to book a fun birthday party. Stop in and check out Crofton’s newest indoor play center for toddlers today! Come in whenever you want, stay for as long as you want. Our classes are during the week. Most are free with entry. Use our facility for your next birthday celebration, click here! Monthly events! Come enjoy our awesome events! Join our mailing list to receive info on classes, events, closures and updates from our team. Great place for babies and toddlers! The area is open so you get a good view of your kid, even if they decide to run across the room. The toys are engaging and the staff is very kind and attentive. I went with my 3 & 1 year old. I really appreciated the staff engaging with both of them by showing them books and how some of the toys functioned. The staff also does a great job on sanitizing the toys and play areas various times throughout the day. Overall, great value and fun! My kids enjoyed it and so did I. We will be back and are considering a membership option. Wonderful place for babies and little kids! It’s huge, there is always something new, the admission price is a great deal, the staff is super sweet and friendly, there are tables and chairs for kids and adults to take lunch breaks — we love everything about it! I have to drag my three year old away . Love the Wiggle Room! As a mom of 3 kids 2 and under this place is my life saver! We have serveral classes on our calendar already, with many more in planning. Most of them are included with entry into The Wiggle Room. 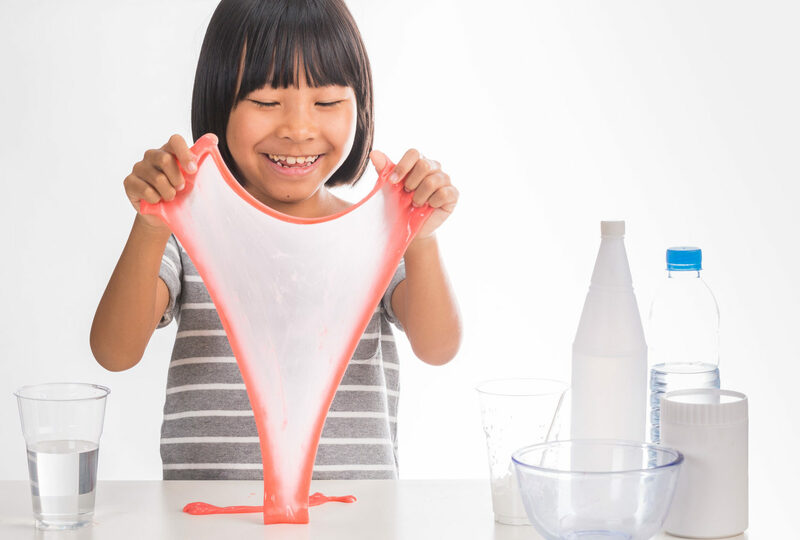 Pictured to the left is our slime making class. Here the kids learn about polymers and mixing ingredients. It a super fun way to teach them about science and following directions. Check out all our other classes by clicking the button below. Keep up to date with the newest classes, events, closures and The Wiggle Room news! Join our mailing list to receive the latest news, events, classes, closures and updates from our team.